Why Is it Important to Care for Baby Teeth? 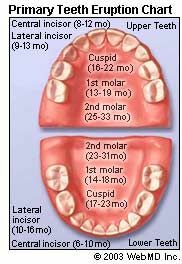 The following chart shows when your child's primary teeth (also called baby teeth or deciduous teeth) should erupt and shed. Eruption times vary from child to child. As seen from the chart, the first teeth begin to break through the gums at about 6 months of age. Usually, the first two teeth to erupt are the two bottom central incisors (the two bottom front teeth). Next, the top four front teeth emerge. After that, other teeth slowly begin to fill in, usually in pairs -- one each side of the upper or lower jaw -- until all 20 teeth (10 in the upper jaw and 10 in the lower jaw) have come in by the time the child is 2 ½ to 3 years old. The complete set of primary teeth is in the mouth from the age of 2 ½ to 3 years of age to 6 to 7 years of age. A general rule of thumb is that for every 6 months of life, approximately 4 teeth will erupt. Girls generally precede boys in tooth eruption. Lower teeth usually erupt before upper teeth. Teeth in both jaws usually erupt in pairs -- one on the right and one on the left. Primary teeth are smaller in size and whiter in color than the permanent teeth that will follow. By the time a child is 2 to 3 years of age, all primary teeth should have erupted. Shortly after age 4, the jaw and facial bones of the child begin to grow, creating spaces between the primary teeth. This is a perfectly natural growth process that provides the necessary space for the larger permanent teeth to emerge. Between the ages of 6 and 12, a mixture of both primary teeth and permanent teeth reside in the mouth. Give the face its normal appearance. Aid in the development of clear speech. To understand the problems that decaying baby teeth can cause in permanent teeth, see Oral Health Problems in Children.